Across from Historic Natchez. Take a walk on the Vidalia river walk or sit & watch historic paddle boats. Enjoy our serene beauty, great festivals & entertainment, southern hospitality & cuisine. Give us a call y'all! We were traveling to South Texas for the winter. 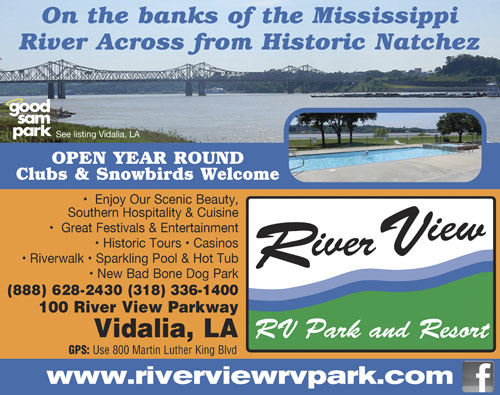 We stayed at River View Campground for 4 nights to rest and enjoy the views and the beauty of Mississippi River. The campground was the best we ever stayed at. Big level sights. Very friendly and helpful staff. We highly recommend this campground. We will probably stay there again on the way home. The campground was easy to find, and roads leading to it were in good condition -- there was construction on the bridge leading in, but this cannot be avoided. The facility itself was nice. Open spacious lots, the staff seemed pleasant, the landscaping was manicured and we were happy here. We stayed for labor day, and was happy to find they put on entertainment. However, when paying for our reservation upon arrival. We were told they did not accept Good Sams membership for the site we were in, because it was one of their cheaper sites. This does not sit well with me, and I believe this violates terms. If you affiliate with Good Sam, you promote yourself as a Good Sam park, not a Good Sam selective site available location. For this reason, I doubt I will go back. Yes I do realize that saving 10% only amounts to a couple of dollars a day, but for me, it's the principal of it. Do not lie to me to get me into the location, and then tell me a different thing when I arrive. Overall, the park was great, and we enjoyed our stay, I would recommend this to others as a nice place to stay. But beware, they seem to be a Good Sam park, for advertising only. Excellent facility right on the Mississippi River! I took a rock to my windshield and the front office staff arranged to have a local firm "inject" to stop it from spreading. What service! Additionally, the grounds were clean and the grass freshly mowed. Historic Natchez is just across the bridge and there is much to do there as well. Again, a great stay at a very nice campground!! We spent four days at this park and would highly recommend it. The nice wide sidewalk along the river provided a lovely trail to walk our dog. We loved the view of the Mississippi River. The spaces were roomy and the park was clean and well maintained. The office staff were helpful from the initial phone call to make a reservation, check in and even called me on my cell phone when a personal package was delivered by UPS. We will definitely plan to stay at this park again on any future visits to Natchez. This is a beautiful park and very well maintained. Easy access into the park and the roads inside the park are wide and easy to navigate. There are 174 sites, all but a few are pull throughs. Most have cement pads. Check in was fast and friendly. There is a rec room, gift shop, pool and hot tub and a playground. There is a 1.5 mile walkway along the river to the Visitor Center. There are a couple of cabins to rent and a large tent area. Laundry and bathrooms were clean. We were in Site 99, concrete full hookups and no issues with any of them. It was plenty long enough for our 37-foot Class A, tow-dolly and parking the car. Nice view of the wide grassy area and the river. Sites are a little wider than normal. WiFi was good and our Verizon signal was strong. They pick up trash at your site throughout the day. We stayed February 13 - 20, 2018 and paid $40.00 a night with our Good Sam discount. You are right across the river from Natchez, MS which has lots of things to do. A very nice and quiet campground with good amenities,conveniently located close to Natchez. Towboats on the Mississippi river can sound like a big old diesel locomotive passing by, but is part of the fun! We loved watching the tows going up and down the Mississippi river. Never seen these before and was very interesting. The facilities are clean with individual bathrooms. Reception staff was friendly and courteous. There is a lang concrete path along the river's edge. Cable not hot, but we don't care too much for TV anyway. Will definitely return to this site if I have to go to this of the world again! River View was one of the nicest RV parks we visited on our cross country vacation. The sites are roomy. The facilities are clean and well managed. Lots of birds and a great view of the Mississippi River. We took some wonderful pictures of the barges on the river. Natchez is just across the river and Frogmore Plantation is 30 minutes away. Great experience! We stayed her for about 5 days and took in the sites in Natchez, Ms. Great city for civil war history. The park was nice, clean. right on the banks of the Mississippi River. Loved watching the big barges go by. The pool area, laundry, store, and main building were all great. TV reception was OK, nothing spectacular. We would stay here again if in the area. We totally enjoyed this park. We had a huge site with lots of elbow room overlooking the Mississippi river. The laundry room and bathrooms were bright and clean and appeared to have been recently upgraded. The lobby area is huge and inviting. The nearby walking trail along the river was an unexpected surprise. The reservation and check-in staff were helpful and very friendly. Make sure to follow the signs and their directions to the park because GPS directions will get you in big trouble. The drive through well-worn neighborhood to get to the park might throw you off a bit. 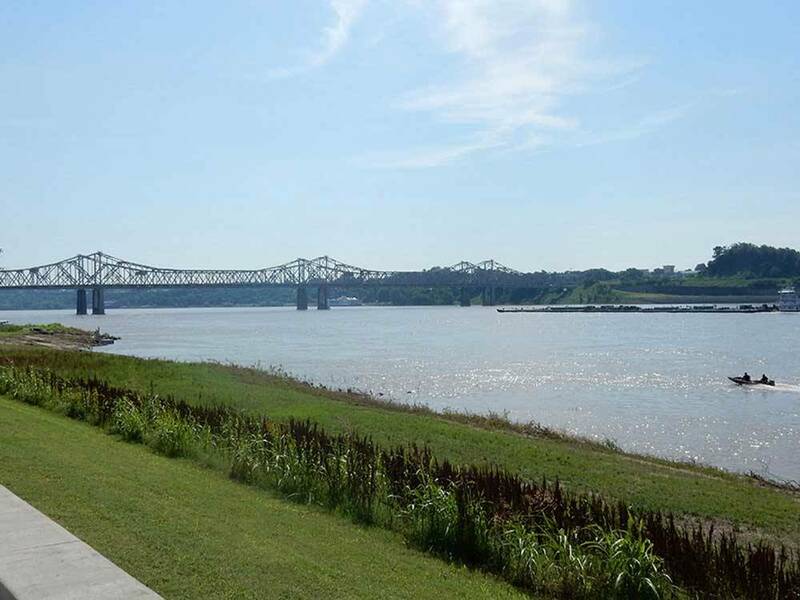 But have no worries, the park is situated on the river side of the levee with a beautiful viewscape. I would definitely return to this park if ever in the area again. This is one of the cleanest RV parks we have encountered. Bathrooms and showers are very clean. They are private bath rooms, heated and comfortable. I'd rate them at a 10.. Laundry facilities are also very clean and fairly new machines. People at the office are very friendly and helpful. We stayed there two nights traveling to visit Vicksburg National Park and the city of Natchez just across the river. Would definitely stay here again.